Summary Broadcom-based selectable dual-band 802.11abgn access point with Enterprise feature set and 802.3af PoE. Access points (APs) are the wireless workhorses for businesses both large and small. They don't share an internet connection (route), but can do all sorts of other tricks including separating traffic into VLANs, QoS, bridging and repeating and sometimes even more. The downside of APs is higher cost, which doesn't usually buy higher performance. 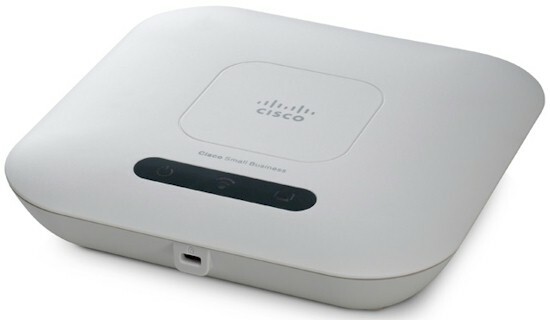 Cisco's Aironet APs have been around for a long time and are well-regarded, but beyond the reach of most very small businesses' budgets. So in an effort to serve those with lighter wallets, Cisco recently introduced two APs—the single-band WAP121 and the dual-band WAP321 that I'm reviewing today. The WAP321 is a selectable dual-band 802.11abgn AP with more features than I expected to find inside its unassuming softly-rounded beige plastic enclosure. Figure 1 shows the rear panel. There are three bi-colored lights on the top of the WAP—power, WLAN and LAN—that flash and change color to indicate status. Instead of mounting screw slots, the bottom of the WAP321 has slots that fit a supplied plastic wall/ceiling mount bracket (Figure 2). The left side of the composite photo below shows the uninstalled bracket and the right side shows it installed. While the AP itself has Kensington locking slots on its front and rear, the bracket itself doesn't have any. Nor does it have any other features to lock the AP in place. The rear shroud covers the ports and power switch and has a knockout for cable routing and a hole for reset switch access. The power switch is sort of an odd touch, since the WAP321 doesn't come with a 12V/1.0A power supply and the power switch doesn't work when the AP is PoE-powered. I used a power supply from one of the new Linksys EA series, which worked just fine. Table 1 summarizes the key components, which show a design based on Broadom components. The FCC ID prefix indicates that the WAP321 is manufactured by Sercomm, a Taiwanese OEM I've encountered from time to time. Note the three antennas while the SoC is 2x2. The third antenna is used to enhance receive gain. The antennas are all 2 dBi metal PIFA (Planar Inverted F Antenna) patch type. Figure 4 shows an unobstructed although somewhat fuzzy view of the board. Note that the SiGe front-ends are not enclosed in an RF "can". The heatsink shown in Figure 3 is actually secured via soldered pins. So I had to enable SSH access, log in and retrieve the processor info from /proc/cpuinfo.